Australia’s World Cup quarter-final featured two such innings, both important to the batsmen involved. To an extent, Australia’s win over Pakistan vindicated Shane Watson and Glenn Maxwell. One is distrusted because he hasn’t been around long enough, the other because he’s been around too long. To their detractors, each is flaky. Maxwell has hushed his critics with recent scores, but a single reverse-swept duck would return them to full voice. Watson’s critics have been career-long, and will not be satisfied no matter how much the national cricket fraternity values him. Yet in a tense knockout chase against a bowler on the rampage, their partnership remained unbeaten, Watson providing the core with 64 from 66 balls, and Maxwell the cap with 44 from 29. Of course, the ‘unbeaten’ part rings hollow: both had been beaten by Wahab Riaz but his fieldsmen couldn’t complete the deal. Watson was missed on 4, Maxwell on 5. Either of those drops might have cost Pakistan their chance; together they certainly did. We’re left to assess what happened afterwards. Watson is criticised for being many things: unreliable, undisciplined, easily distracted, unable to tough it out. Here, he created a lasting memory. Wahab might just have bowled the best spell of this World Cup. Watson was the man who survived it. Wahab’s pace and bounce had forced Michael Clarke to fend to short leg. Watson might have done the same half a dozen times. Immediately Wahab was at him, 150 kilometres per hour, bowling short and at the body. Watson was flinching, twisting, fending the ball to the vacant off-side, then just wide of the leg-side catcher, then over slip. His one attempt to hook nearly finished him. Wahab roared at the drop. Then he was straight back at it, slamming the splice and the bat handle in front of Watson’s throat. He followed up each ball to glare, not in rote pantomime but glittering fury. He felt the game depending on him, right then. He clapped his field, mouthed off angrily, hurled down the stumps. At the end of the spell, Watson was still there. An Australian bowler showing the same aggression would attract lectures on sportsmanship, but from an underdog team defending an underdog total, it seemed magnificent. Unfair, you may say, but so is cricket. Unfair was Friday night for Wahab, coming back for his second spell. 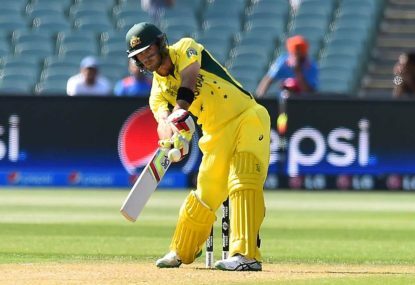 When Maxwell did take guard, he was not replacing Watson but Steve Smith. It was 4/148, not 4/76. Wahab did not have the same energy. Nonetheless, his first ball to Maxwell was a bouncer. Maxwell flinched from the line, crouching while playing a mutant of a cut shot interbred with a forehand. He wasn’t even vaguely looking in the ball as he sliced it. The catch wasn’t taken at third man. When Watson was dropped from that hook shot, he put the stroke away. When Maxwell was dropped from an improvised attempted smash, he settled himself and then started playing more of them. Maxwell has this burningly clear-headed approach. His success this World Cup has come when walking out with licence to swing. The question was whether he could be valuable in a different context, and what he would do. Turned out the answer was yes, and that he’ll play exactly the same way. This time it worked. He defended when he needed to, but Maxwell’s shots flew away. Tension was dispelled by how quickly the score grew. Watson’s strokeplay expanded. Against every non-Wahab bowler, he ranged from comfortable to dominant. Watson likes batting with Maxwell, after plundering against Sri Lanka in the pool stages. Perhaps Maxwell makes Watson feel liberated to attack when he wants without feeling like he has to force the pace. Finally there was the symbol of the struggle won. Wahab bowled short. Watson dusted off the pull shot. This time the contact could not have been more true. The ball went flat over square leg and into the assembled spectators. The spell had been broken, the magic bled away. Watson had prevailed – a dose of luck, no doubt, but better players than he have enjoyed their share of that. This article was first published in Wisden India.